Pro Athletes: They’re Snowbound Just Like We Are! Had the Falcons beat the Saints last night, like many thought they would (and as you might expect the NFC's No. 1 seed to do), the Giants would have had two paths to the playoffs with a win over the Redskins next Sunday: the Packers losing to the Bears, or the Saints losing to the Buccaneers. The Saints beat the Falcons, though, so now the Giants have only one. The Giants need to beat the Redskins and have Green Bay beat lose to (sorry) Chicago (or tie, we guess). The Packers looked dominant over the Giants last week and will have a wild, desperate crowd at Lambeau Field, but they'll be facing a Bears team that has nearly as much to play for as they do. The difference between a No. 2 and No. 3 seed in the playoffs is profound; you get a bye, possibly two home games, and a week off at 2, and you go on the road after having to struggle through one game at 3. A win assures the Bears a No. 2 seed. That might not matter, though. Giants fans, if you can stomach it, you need to cheer like crazy for the Eagles tonight against Minnesota. If the Eagles lose to the Vikings — unlikely, sure, but you never know — the Bears will clinch that No. 2 seed (because they beat the Eagles earlier this year) and thus will have nothing to play for Sunday. They could start third-string Caleb Hanie in that game if they wanted to. The Packers are unlikely to lose to Caleb Hanie. So, uh, go Eagles tonight? But the Giants, the way matters are going right now, are the biggest of all their concerns: Can they even beat Washington right now? (After all, the Packers are currently bigger favorites over the Bears — 6.5 points — than the Giants are over the Redskins — 4 points.) 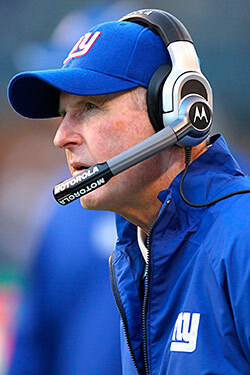 Everyone's screaming for Tom Coughlin's head — and Eli Manning's too? — and the team looks like it's ready to go home. But there is still a chance. The Packers-Bears game and the Giants-Redskins games will be going on at the same time, 4:15, so no one will know anything by kickoff. Better find a bar to watch both games. They're equally important now.